For a brother who is nothing less than the best, he should be pampered with best Rakhi on Rakshabandhan. From being your secret keeper to the biggest monster, he has multiple roles in your life. 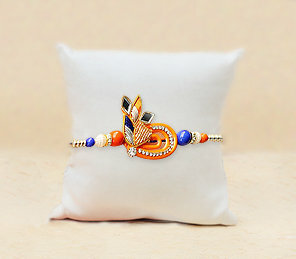 Send rakhi gifts for brother online and give him a surprise to remember with scintillating from FlowerAura. Rakhi is a festival that witnesses immense love between a brother and a sister. No matter how many times do a brother and sister fights throughout the year, Raksha Bandhan is one such occasion when they forget every fight and express their love for each other. Yes, on the auspicious occasion of Raksha Bandhan, the sister ties a rakhi around her brother's wrist and pray for his longevity. The brother in return give rakhi gifts takes an oath to protect his sister from all the evils till his last breath. In case, the brother is younger to the sister then, the sister offers rakhi with gifts to brother. This is how the auspicious festival of Raksha Bandhan strengthens the bond between brothers and sisters. So, if you don't want to ensure a bad rakhi gift idea hamper your celebrations then, check out the best rakhi gift ideas for brother available at FlowerAura. Yes, if you are looking for the best gifts for brother on rakhi then, you are at the right place. We, at FlowerAura, offers you a wide range of online rakhi gifts for brother that are unique and meaningful. From cushions to customized mugs, chocolates to grooming kits, rakhi cards to sweets, we have huge assortment of rakhi gifts for brother available at our online gift portal. FlowerAura has a vast range of Rakhis with a variety of embellishments to choose from. Be it a kundan rakhi or a silver rakhi or gold rakhi or pearl rakhi or zardosi rakhi or spiritual rakhi, we have all types of rakhis to ensure a beaming smile on your brother's face. Even if the brothers stay away, sisters make sure to send Rakhi for brother and tell them about the lifelong bond of love they both are tied in. While the festival typically celebrates the love and affiliation between brother and sister; it has a much deeper saintly connotation. The unadulterated bond shared between a brother-sister is remarkably the best among all relationships. They fight, scold, hate yet love each other so much which are beyond imagination. To celebrate this beautiful bond, we offer you a wide range of exquisite rakhis online that have been beautifully crafted with utmost perfection. So, now you can order or send a Rakhi for brother online online from FlowerAura comfortably seated at your house of office or anywhere and enjoy free shipping. It also offers Rakhi in combos and hampers so that you can send Rakhi online with free home delivery and reminisce the relations of the childhood filled with love and adoration for each other. Rakshabandhan is an occasion where it's not only the responsibility of the brother to shower their sisters with love but It's also a day when sisters should take some time out to let their brothers know how much they care for their brothers. This is when FlowerAura steps in with Rakhi gifts delivery online to the beloved brothers so that they also know how much their sisters care for them. We, at FlowerAura offer you a wide range of rakhi special gifts for brother that are sure to infuse happiness and laughter in your life. Some of the best rakhi gifts for brother available at FlowerAura are 'Magical rakhi combo', 'Joyful rakhi combo', 'Special mug hamper', 'Heart warming rakhi combo', 'Chocolate Zari box', 'Colorful rakhi wishes', 'For my rockstar bro', 'Miss you bhai', 'Awesomest brother', 'To the coolest brother', 'Tempting rakhi hamper', etc. With an option of instant delivery , you can also send Rakhi return gifts for sister. You can always count on FlowerAura for sending your sisters the most love-filled gifts for Rakhi. No matter in which part of India your sister resides, FlowerAura would undoubtedly reach her to surprise her with your handpicked Rakhi gift for her. This Rakhi, remind your sibling that your love for them is unconditional. And to show the same, you don't need to have any second thoughts because FlowerAura has arrived with some expressive hampers which won't only show your love for your brother or sister but are also so pocket friendly that you would not have to think twice before ordering Rakhi gifts. Whether you want to send gifts for brother on rakhi, you can find it all with ease at FlowerAura. So, this Rakhi, don't let the joys of celebration fade away when you have some amazing expressions of love to celebrate the relation between a brother and a sister. Bring delight to the occasion by sending Rakhi or Rakhi gifts for brothers and sisters and let the memories of the same last for lifetime. FlowerAura delivers Rakhi to all parts of India. No matter where your dear brother resides, order for same day delivery and surprise your brother with scintillating Rakhi. Besides, if you have your brother living in Jamshedpur, you have a chance to wish your brother a very Happy Rakhi full of love and adoration because FlowerAura has given you the ease of online Rakhi delivery to Jamshedpur at your brother's doorstep. Now, you can American Diamond Rakhi to your dear brother and let him know how much you still care and love him. Not just this, FlowerAura also gives you an option of same day delivery so that the right moments never miss out. Besides, even if you have forgotten to send something for your sister when you are living far away, you can send Rakhi online with same day delivery option from FlowerAura.